Remember the beginning of Lent, when I said I wanted to lay out a vision for how Christian men can think about God, the Church, and Theology in a way that takes into account the concerns of feminists? I said that these thinkers had been exposing the very real damage that has been wrought by us treating “White Male Theology” as default, neutral, objective “Theology”. Well, believe it or not, we never actually got to what I wanted to write about. Full disclosure: that whole series was conceived because I had written a paper on this topic that I was proud of–a paper I wanted to edit down and make into a series of blog posts. And yet, before we could get to what amounted to a term paper, I had to take the reader through a lot of the other ideas that were in the rest of the class. We first talked about Jesus and feminism, how males can even think “feminist-ly”, and then I wrote a whole mini-series on referring to God in feminine terms. I had no idea how many problems that series would cause. Many of my friends still think I’m lying when I say that; that I knew very well the pot I was stirring. Nevertheless, I poured myself so deeply into that series, it kind of derailed the whole point of starting this conversation in the first place: to articulate a way forward. So that’s what I want to do. For the next couple of weeks, I’m going to start posting on this whole “Christian Male Feminism” thing. These upcoming writings are more or less a systematic approach to theology. As I said before, I think that they way we think about and talk about God can (and should) change depending on the context we’re speaking to. What I want offer is a way of thinking about God, Humanity, the World, and Life that men (particularly, but not exclusively) can use when trying to take into account the experiences of their sisters. Actually, it’s more than “taking into account” these experiences. It’s not simply trying to incorporate (or more accurately, subsume or colonize) women’s experiences into men’s. This still makes male experience as the primary way of defining reality. What I will attempt to do is propose what our theology should look when males take their privileged and historically preferred views of God and submit them to the experiences of our sisters who have been so often marginalized, silenced, and ignored. I actually want to see what happens when our theological articulations defer to and prefer women’s experiences. Yes, this is something I’m passionate about. And I don’t think it has to be needlessly controversial as a stumbling block to others. I think this is something that all Christians can and should embrace at least a little–even if you’re the most conservative, male-leadership, complementarian-type brother or sister out there. I think there are ways we can all listen to our sisters and love them better, all while being biblical, faithful, and striving for the Glory of our God. And so with this little introduction and vision casting, we’re back on track. First stop? 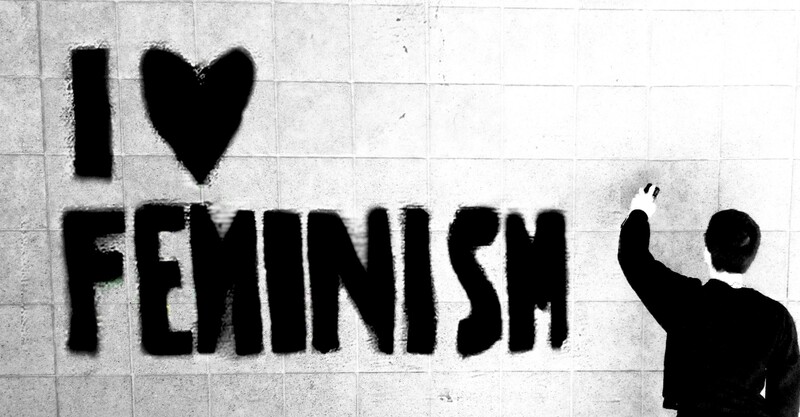 How should a male feminist think of God? How? Well it’s actually pretty simple. My suggestion is he should think that God will view men and women equally, snce the definition of feminism is the political, social and economic equality between the sexes. That’s the goal of feminism… equality (A.k.a. fair treatment) between the sexes right? Right. So in that regard, a male feminist can see that God will view all genders the same way. If a man sees men and women as equals and believes he is a feminist, then he can see that God would both value men and women equally, not one above the other. But if a man does not believe that and thinks men should be valued more so than women in God’s eyes, he likely is not a feminist. Thanks for your comment! Maybe I should have been clearer. I know lots of men that would say that, in the sense you described, they are feminists. And yet, they don’t see the depth that their maleness has influenced their theology. And so, I’m not mainly talking about social, economic, and political feminism, but feminist theology, which is its own thing, and a discussion distinct (but not entirely disconnected) from social gender equality. I think when you see God through the eyes of women, you actually come to different conclusions traditional male theology. But anyway, keep reading these posts and let me know what you think! I could definitely use all the perspectives I can find. Thanks again for writing!